What Else Works? has developed out of a growing awareness amongst practitioners that centralized notions of what works and ‘one size fits all’ approaches to work with offenders and other groups is inevitably limited in its scope and effectiveness. 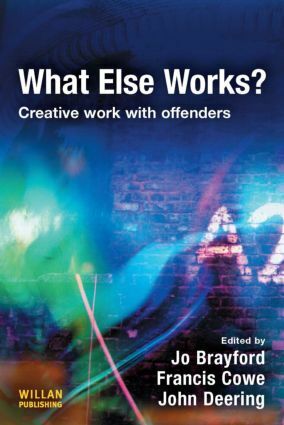 The book seeks to dispel the view of probation service users as 'offenders', and socially excluded people as 'problems' to be managed and treated, and instead considers more creative alternatives to reduce both re-offending and social exclusion. These include working separately with women, black and minority ethnic groups, local community-focussed projects, in education and nature and conservation programmes. The reader is encouraged to think about past and current policy, practice, and the relationship between practitioners and offenders or other socially excluded people. Questions are raised as to whether, and how, practice could be different and contributors explore the theme of creative and change-focussed practice or focus on a particular approach to a practice. This book will appeal to students on criminal justice, criminology and social work courses, professionals operating in these fields as well as the wider audience of professionals and academics who may engage with these ‘service users’ from a range of policy and practice perspectives. What else works–backto the future?